Another easy-ish conversion but I wanted to try my hand at a big city so now we have a Portuguese version of Gettysburg as well. 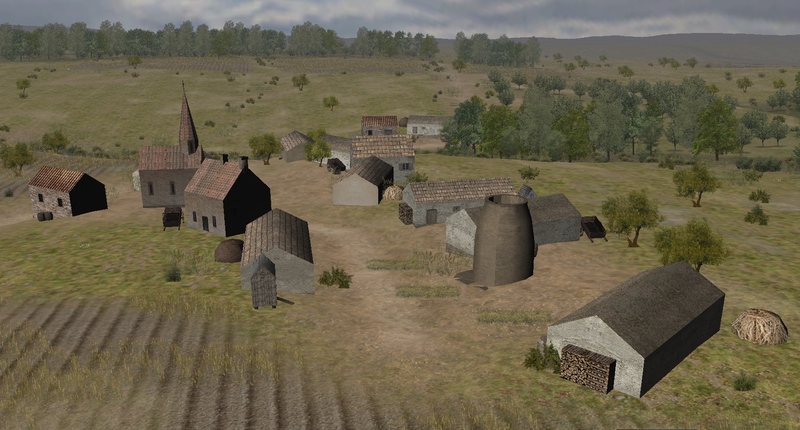 This map is very familiar to all of us but it suddenly looks very different with different vegetation, ground textures and buildings. The grid street plan of Gettysburg means the city doesn't really look very European and there's nothing to be done about that. I have tried to leave some open spaces in the city for troops to deploy and I haven't packed each block with buildings. I even had a go at an industrial area as well. The distant spires of Chavez are seen across a dusty plain. 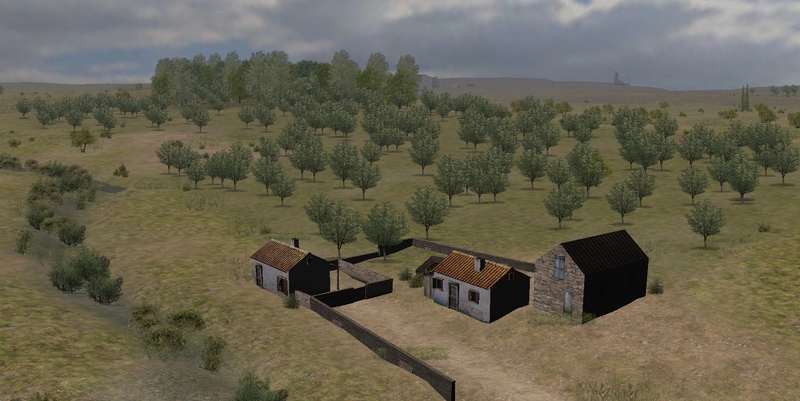 A peasant farmer's smallholding among the olive groves. The royal highway descends off the ridge down into the city. The barking of dogs and bleating of goats are the only sounds that disturb the midday heat. 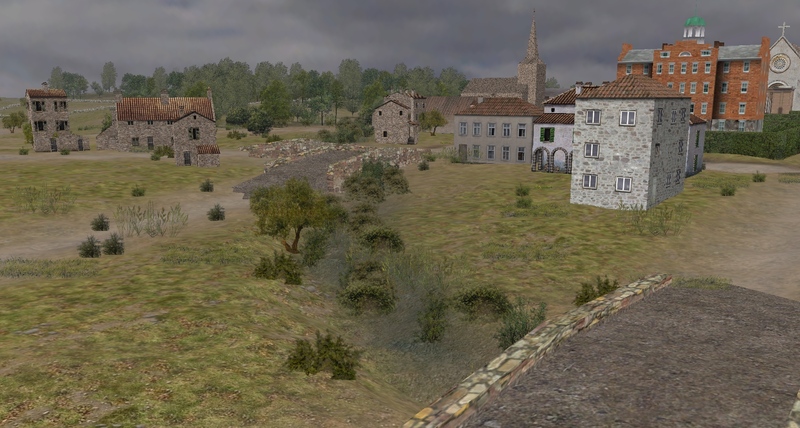 On the western side of the city three low stone bridges give access across a small river. Very nicely done. It is like having a brand new map to play on. Your new ECF map was like that too. Thanks. Its been a lot of fun (even with the problems). I like working on the Mediterranean region maps - they are just that bit more bright and cheerful. I find the WL stock maps a little dull and lacking in vitality after a while. Anyway, getting close to completion now. I have a couple of buggy bridges that show in the editor but not in game. I've found that deleting them, saving and then reinserting them seems to work. So here's a slide show. The first few shots are taken in the editor and this series is titled "fun with walls and fences". You can do an awful lot with the editor, making things you don't have by squeezing, stretching, squashing and part-burying other objects. Then I include some in-game shots. 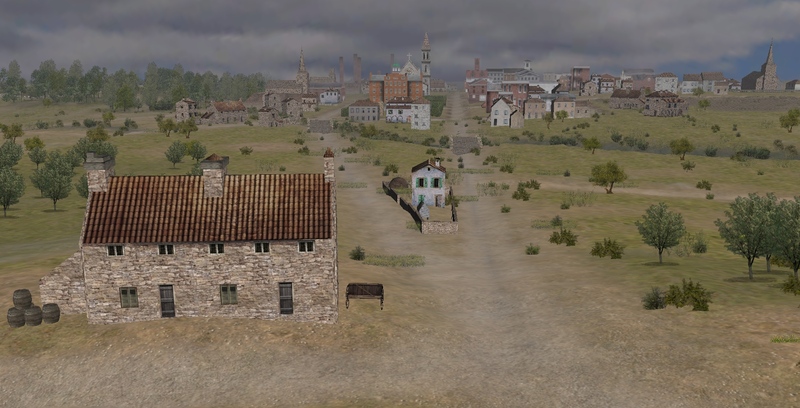 Can anyone guess the locations from the old (ACW) version of the map? Very nice. It's a huge improvement from the original map. Are the stairs and building foundations a new addition? No, those are all a few basic wall sections but with the XYZ axes changed and sunken into the ground. As I mentioned you can do a LOT with the basic pieces. The sprites tend to avoid them the same as they do with buildings and I haven't really tested them much but I was sick of floating buildings and wanted a way to fix the gaps under them. You can tell from most maps that map makers much of the time use a helicopter camera - get down to 1st person height and many maps have ugly flaws in them, building placement being one of the biggest. Have been away, but please accept a belated pat on the back for your hard work here, Diggers. I think your new map versions look excellent, and very much hope you persist. Its huge fun, and a great way to spend many sleepless nights! I've done the two 2.5mi maps now and am going to tackle the Chickamauga 7.5m Germany conversion next. Pom and Crikey are making a set of German buildings for us. I've taken a look at a couple of Garniers random maps but these are completely soulless and very boring to work on! Have put both those projects (one French, one Polish) aside for now. I haven't yet tackled the issue of making fortified buildings. I know how to do it, just haven't dipped my toe in the techy aspects yet. I've also gained a new respect for the greyscale bmp that underlies the terrain map and determines all the walls and vegetation. Its a tremendously powerful and flexible system. Really enjoying fiddling with that.